Тема конкурса в этом году – «Театр как публичное пространство». Участникам нужно создать временную театральную площадку в общественном центре на месте заброшенного стадиона в Синьчжу (Тайвань). Своеобразная «театральная деревня» должна включать в себя открытые и закрытые сцены – здесь будет проходить по несколько представлений одновременно. В проектах необходимо предусмотреть использование недорогих материалов, а также возможность демонтажа конструкций и их установки в другом месте. 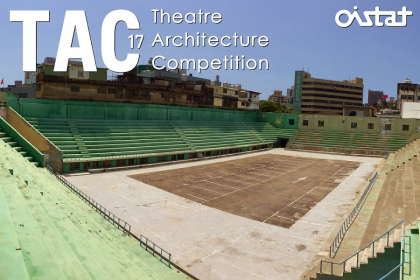 The OISTAT Theatre Architecture Competition is an in­ternational ideas competition, aimed at students and emerg­ing architecture practitioners, and is organised by the Architecture Commission of OISTAT (International Organisation of Scenographers, The­atre Architects and Technicians). The 10th Theatre Architecture Competition 2017 is generously supported by the Hsinchu City government of Taiwan, including the international symposium, jury meeting and exhibition in Hsinchu City in March/April 2017, and will then be shown at World Stage Design 2017 at Taipei National University of the Arts from 1-9 July 2017, where selected entries will be exhibited and the cash prizes awarded. World Stage Design is a major international theatre design exhibit and event, which takes place every four years under the auspices of OISTAT. Taiwan is currently constructing several major new performing arts centres, with multiple auditoria, designed by significant international architects, which will be completed in 2017. The aim of the competition is to challenge the conventional typology of the theatre and will be focusing on the design of a temporary theatre (or theatres) in The Public Activity Center, a disused sports stadium in Hsinchu City in Taiwan. The story behind Hsinchu Public Activity Center can be traced back to the Hsinchu City Government’s establishment of a public square North of its location. The public square gradually lost its functionality and the government then constructed a new indoor sports center nearby, on Wuchang Street. In its early days this indoor sports center attracted many for playing basketball and volleyball and was also a popular venue for recreational activities in the neighborhood. Unfortunately, over time, people found the sports center no longer served their needs due to its poor facilities and equipment. As a result, the government removed the original roof and turned the sports center into a parking lot, which became The Hsinchu Public Activity Center. Today, the site is used for public events, such as political rallies or athletics competitions. Having lost its original use and fallen into disrepair the site is now seeking a new use for this once vibrant area.